Virality is a metric that has been borrowed from the field of epidemiology. It pertains to how quickly an element or content spreads through the population. Thus, these elements could be voluntarily or involuntarily adopted. Applying it to the world of digital content, I will restrict my scope to that of voluntary adoption by participants who have come into contact with the elements. The two driving factors around virality relate to Viral Coefficient and Viral Cycle Time. They are mutually exclusive concepts, but once put together in a tight system within the context of product design for dissemination, it becomes a very powerful customer acquisition tool. However, this certainly does not mean that increased virality will lead to increased profits. We will touch upon this subject later on for in doing so we have to assess what profit means – in other words, the various components in the profit equation and whether virality has any consequence to the result. Introducing profit motive in a viral environment could, on the other hand, lead to counterfactual consequences and may depress the virality coefficient and entropy the network. You will often hear the Viral Coefficient referred to as K. For example, you start an application that you put out on the web as a private beta. You offer them the tool to invite their contacts to register for the application. For example, if you start off with 10 private beta testers, and each of them invites 10 friends and let us say 20% of the 10 friends actually convert to be a registered user. What does this mean mathematically as we step through the first cycle? Incrementally, that would mean 10*10*20% = 20 new users that will be generated by your initial ten users. So at the end of the first cycle, you would have 30 users. But bear in mind that this is the first cycle only. Now the 30 users have the Invite tool to send to 10 additional users of which 10% convert. What does that translate to? It would be 30*10*10% =30 additional people over the base of 30 of your current installed based. That means now you have a total of 60 users. So you have essentially sent out 100 invites and then another 300 invites for a total of 400 invites — you have converted 50 users out of the 400 invites which translates to a 12.5% conversion rate through the second cycle. In general, you will find that as you step through more cycles, your conversion percentage will actually decay. In the first cycle, the viral coefficient (K) = 2 (Number of Invites (10) * conversion percentage (20%)), and through the incremental second cycle (K) = 10% (Number of Invites (10) * conversion percentage (10%)), and the total viral coefficient (K) is 1. If the K < 1, the system lends itself to decay … the pace of decay being a function of how low the viral coefficient is. On the other hand if you have K>1 or 100%, then your system will grow fairly quickly. The actual growth will be based on you starting base. A large starting base with K>1 is a fairly compelling model for growth. This is the response time of a recipient to act upon an invite and send it out to their connection. In other words, using the above example, when your 10 users send out 10 invites and they are immediately acted upon ( for modeling simplicity, immediate means getting the invite and turning it around and send additional invites immediately and so on and on), that constitutes the velocity of the viral cycle otherwise known as Viral Cycle time. The growth and adoption of your product is a function of the viral cycle time. In other words, the longer the viral cycle time, the growth is significantly lower than a shorter viral cycle time. 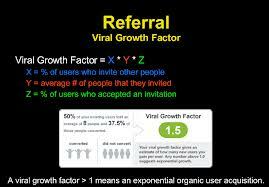 For example if you reduce viral cycle time by ½, you may experience 100X+ growth. Thus, it is another important lever to manage the growth and adoption of the application. So when one speaks of Virality, we have to consider the Virality Coefficient and the Viral Cycle Time. These are the key components and the drivers to these components may have dependencies, but there could be some mutually exclusive underlying value drivers. Virality hence must be built into the product. It is often common to think that marketing creates virality. I believe that marketing certainly does influence virality but it is more important, if and when possible, to design the product with the viral hooks. Posted on October 14, 2012, in Chaos, Financial Metrics, Innovation, Product Design, Social Dynamics, Social Network, Social Systems, Virality and tagged beta users, invites, K, product adoption, product design, referrals, social network, social systems, viral cycle, viral hooks, viral loop, viral tools, virality. Bookmark the permalink. Leave a comment.